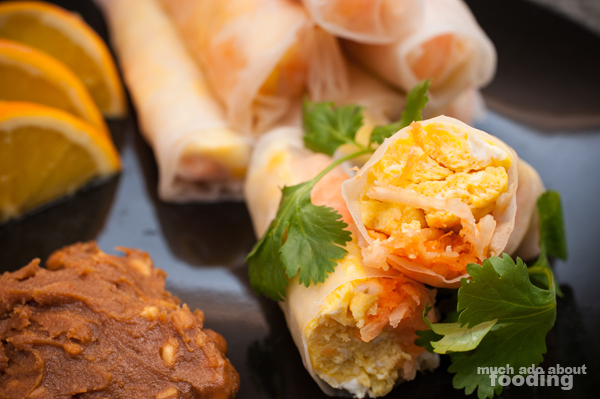 I have fond memories of waking up on weekends and walking into the kitchen to find these brightly colored spring rolls for breakfast that my mom whipped up. There is something just so tasty about the natural vegetal sweetness of the jicama and carrots mixed with the saltiness of Chinese sausage and eggs. Of course, you can't forget the peanut hoisin sauce either! 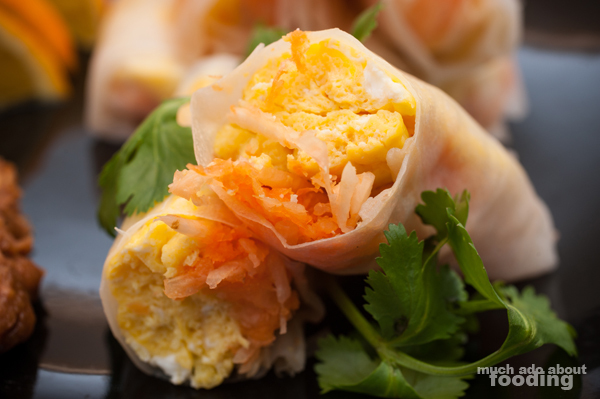 This is a lovely Asian spin on breakfast foods that I insist you try. It's easy enough to make too! Peel your vegetables and coarsely grated into a bowl. Squeeze and drain out any excess liquid as making the filling too wet will make it hard to wrap. Slice up your Chinese sausages as well. In a large bowl, beat together your eggs and add in the fish sauce. I said "straight" in my ingredients list to indicate the fish sauce in the bottle, not the one already mixed with chili peppers, sugar, and lemon. For the vegetables, they only need to be heated up a bit. You could stir them around in a small skillet or you can be slightly lazy like me and stick them in the microwave with a damp paper towel over them. After heating, drain excess liquid again. For Chinese sausages, fry slightly in a skillet before placing aside. The hardest part of cooking will be the eggs which must become "blankets" for the wrapping. 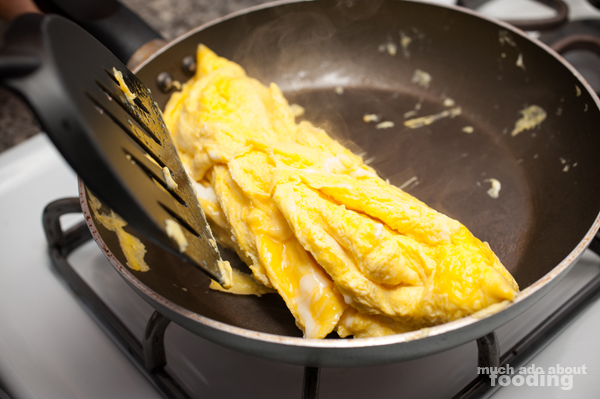 What I do is heat up a skillet on high with oil and then turn off the fire; right afterward, I pour in the beaten eggs and allow the bottom layer to firm up (but not fry). I edge the mix horizontally so the rawer portion can fill in the empty space again and then turn the heat back on to medium. 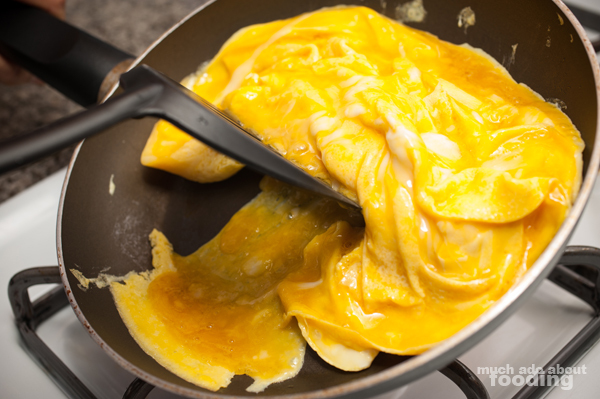 Do this repeatedly until you have an egg "blanket" of sorts. I only indicated the ratio for the sauce because I don't know what amount you all like. Duc loves peanut butter so I think he scooped out just about half a cup of the stuff...Anyhow, you want to soften the peanut butter first (microwave time!) before stirring in the hoisin sauce. You end up with a sweet, salty dipping sauce for your rolls! 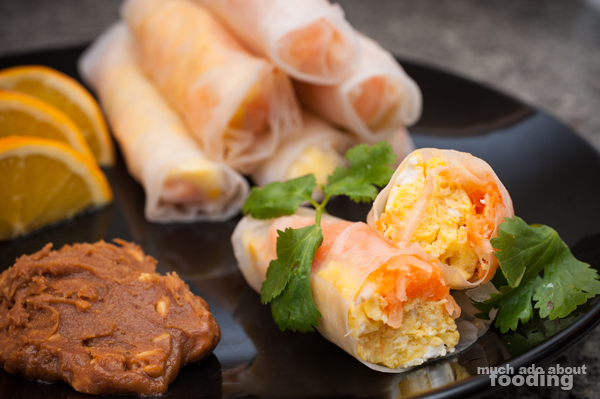 To make your rice paper rounds workable, you have to soak them very briefly in water and drain the excess. Lay on a large enough plate or even clean cutting board. Divide your egg into about twelve even parts and lay a piece down first. Cover with adequate amount of vegetables and place two slices of sausage on top. Wrap like a tight burrito, repeat, and enjoy!